My biggest problem with the classic version of the team – stretching all the way to Avengers Disassembled, with a few exceptions between – is the fact that The Avengers seems to wallow in itself. The book reads as if it never has a need to justify its own existence, with these superheroes hangin’ out and being superheroes in the most reflexive manner possible. There’s nothing as grand as the mythology of early Thor stories, or as human as those first Amazing Spider-Man comics. There’s no meditation on world affairs, no insight into the human condition, no bold philosophical statements. The Avengers are just a bunch of people with super-powers who hang out together in an extensive house in the middle of New York because that’s just what they want to do. Their name is… arbitrary, at best. It’s suggested by the Wasp in the final panel of the first story, but with no real justification offered. What do they avenge? Surely that’s a pretty dark name for a bunch of technicolour heroes? 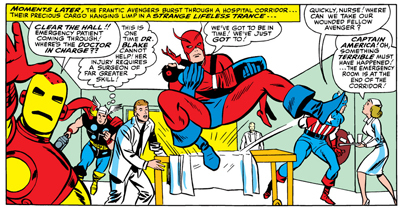 After all, Lee and Kirby’s Avengers are hardly a death squad or anything like that. There is an argument to be made that superheroes form their own distinct class in the modern Marvel universe, existing above (and divorced from) the concerns of petty mortals. However, it’s hard not to get that sense reading these original Avengers comics. The Avengers are presented as something of a super-powered 1%, with their fancy gadgets and their butler and their class accommodation. “Even when there is no task before us, we still meet regularly, to get to know each other better!” Iron Man proposes, as if to suggest that just hanging around being super-people is more important than doing their own stuff. The whole damn system is out of order! When Captain America is caught in the throes of depression, Wasp suggests that a nice super-hero ego boost might be in order, and he might cheer up if he gets a chance to see some of the super-happy-awesome fan-mail that the Avengers receive. “Show him the mail we’ve received, from all over the world, Thor! maybe that will cheer him up!” There’s something incredibly self-absorbed about all this, and it’s compounded by the seriousness with which the Avengers take themselves. I get that the Avengers are supposed to be a bunch of super-powered friends meeting in a fantasy version of a young boy’s tree house, and that their DC counterparts in Justice League of America were no better, but there’s something very unnerving about all this self-importance. These are Alan Moore’s “over-people” from his Swamp Thing run, only they don’t meet in the sky. They have a nice property in the good part of town, seemingly immune to the type of property devaluation you’d expect from attracting so many terrorist attacks so frequently. At one point, an issue opens with group reprimanding Iron Man for “failing to answer an Avengers’ Alarm!” He is called before an Avengers “special board of inquiry session” to review his conduct, ending up with a suspension. Which is a bit weird. Surely the world is safer with Iron Man on the team, rather than off it? Can’t Iron Man be off doing his own superhero-ing in his free time? If I were Tony Stark, I’d be quite miffed at being rebuked for that. These are characters who save the world several times a month – if they don’t answer the call from the Avengers, it’s not unreasonable to suggest that they probably have a valid reason. There is no escape from the Fortress of the Mole! When Iron Man goes missing in The Mighty Avengers Meet Spider-Man!, the group is more concerned about what it means to their little association than the implications for Iron Man or the general public. “Hence, I move that we suspend all operations for twenty-four hours as a mark of respect to the late Tony Stark, whose home we now occupy!” Captain America proposes, suggesting that the rest of the world is right out of luck if the Masters of Evil decide to go on a rampage. Naturally, this causes all sorts of trouble, in a suitably bureaucratic fashion. 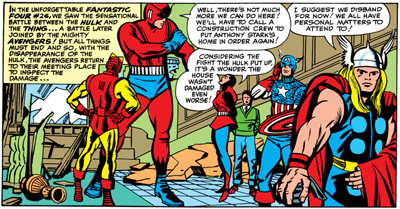 “Thanks for your support, Cap,” Ant-Man remarks, as if addressing congress or the UN or some such august association, “but I’d like to amend your motion…” When Rick Jones cuts in, Captain America is having none of it. “You’re out of order, Rick! You have no voting privilege with the Avengers as yet!” Ah, The Avengers, the comic where you can watch all your favourite heroes shout “out of order!” and “objection!” at one another inside their posh headquarters instead of… you know… actually acting like heroes. The Avengers are presented as super-powered celebrities, but without a hint of irony. There’s no hint of criticism of vacuous celebrity culture as the Avengers seem to be known and loved for the simple act of being Avengers. Fans and press crowd outside their mansion for a brief glimpse of their idols. The Wasp signs autographs. 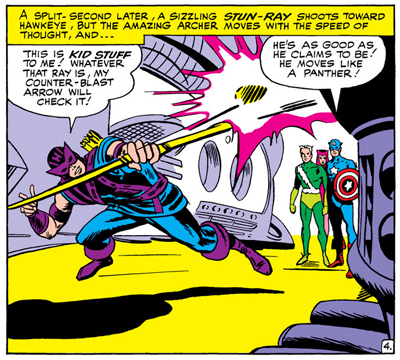 When the team breaks up, Hawkeye tries to leverage himself a guest slot on the Ed Sullivan show. This celebrity goes to their head. In Trapped in the Castle of Count Nefaria, the villain arranges a tour for the superheroes. Captain America is quick to put his merely human sidekick in his place, “Rick, you and the teen brigade wait outside till the doors open for the public!” The advanced sneak preview is apparently only for real superheroes. The normal people have to wait in line. It would work a lot better if there were hints of self-awareness or irony to this, as it almost reads as a condemnation of shallow obsessive celebrity-for-the-sake-of-celebrity culture. Instead, it’s all played entirely straight. 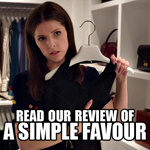 Despite these significant flaws, there is still a lot to like about The Avengers, including the suggestion that it might be smarter than it initially seems. There is the occasional hint of self-awareness from Lee’s scripting and dialogue, as if he’s acutely aware of the absurdity of it all. In The Bitter Taste of Defeat, Erik Josten is quite happy to receive all manner of super powers, but is less keen to wear a silly supervillain outfit or adopt a suitably grandiose supervillain name. “If you ask me, this is real cornball stuff,” he concedes. 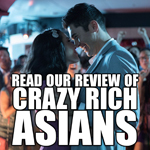 Lee falls back on his familiar trope of putting the team through hard times to help the reader empathise with them, and he repeatedly opts to attack the public’s perception of the team. It’s not sharp enough to feel like a shrewd deconstruction, but there’s something very astute about Lee’s comments on the damage caused by even a victorious superhero battle. 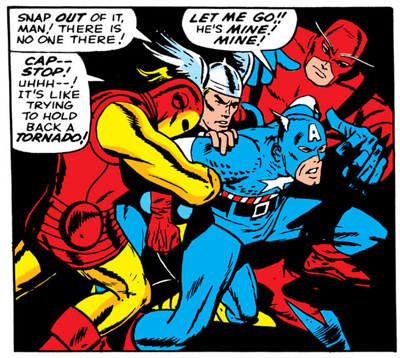 In the old Marvel stand-by, the bad guys attack the team by attacking their reputation. 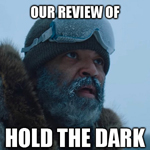 For the Avengers, this means suggesting gross indifference to the lives of the people they are supposed to protect. “The public is beginning to think of us as irresponsible troublemakers,” the Scarlet Witch laments. There’s also a rather wonderful undercurrent of mythology and legend running through the comic, as if Stan Lee and his collaborators are aware of the fact that they are fashioning a new American mythology. 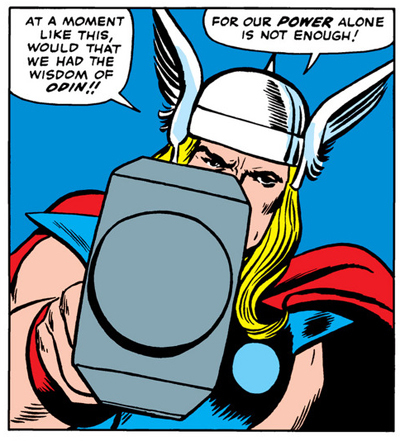 Most obviously, The Avengers is rather firmly grounded in the iconography of Thor. Captain America is arguably the book’s central character, and the book recruits its own cadre of villains and supporting cast members, but Thor’s supporting cast pop up with surprising frequency, as if inviting the reader to make the connection between The Avengers and grand myth. Loki is, after all, responsible for the formation of the team, creating a crisis so large that more than one hero was needed to help cope with it. The recurring villainous team of the Masters of Evil is anchored by Baron Zemo, the Enchantress and the Executioner. Despite his ties to Captain America’s past, Baron Zemo is an original character, making the Enchantress and the Executioner the two most important recurring characters. 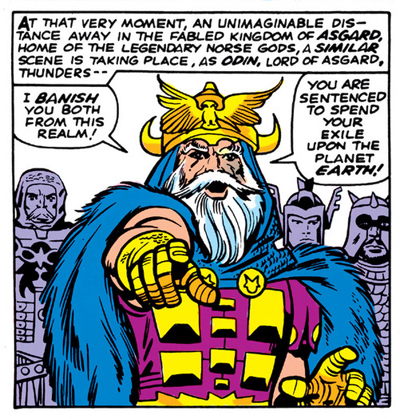 “How handsome you look,” the Enchantress remarks to Simon Williams in his snazzy outfit, “almost like an immortal of Asgard!” In Among Us Walks… A Goliath!, the connections become even stronger. Quicksilver explicitly notes the biblical origins of Hank Pym’s latest codename. “Why else would his name be legend?! !” he asks Hawkeye. The team find themselves competing against the Collector, who seems to have a knack for picking up items from legend – including pieces of the “flying carpet of Persia” and “beans which inspired the legend of Jack and the Beanstalk.” Naturally, he has set his eyes on the team. It’s a nice touch, and perhaps one that explains the whole heroes-for-the-sake-of-heroes stuff. It would seem that The Avengers are a social class unto themselves, they are living legends, elements of a mythology still being formed. 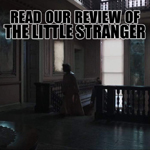 It’s a rather clever hook, even if it never feels explicitly stated or articulated enough to excuse the sense of indulgence in some of these early stories. More interesting, albeit less pronounced and developed, are the wonderful Kirby influences. Jack Kirby’s tenure on the title ran for the first eight issues and then two more. As a result, his impact on The Avengers as an entity in and of itself is not quite as great as his influence on many of the individual members. 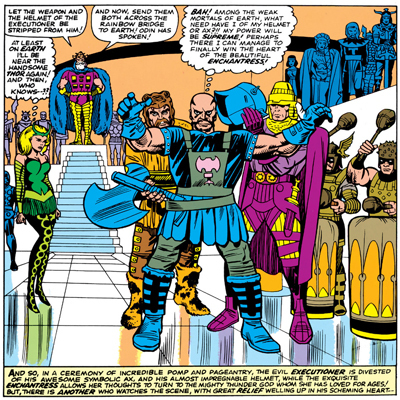 In particular, Kang the Conqueror and his out-of-time army seems like a delightful Kirby concept that is never developed as thoroughly or as sufficiently as it should be. 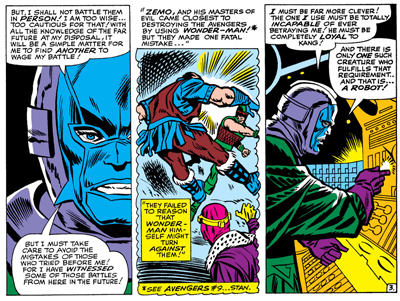 I have a massive fondness for Kang as an Avengers villain, but I’d argue he has always had difficulty living up to his potential, introduced in the last issue of Kirby’s introductory eight-issue stint on The Avengers. 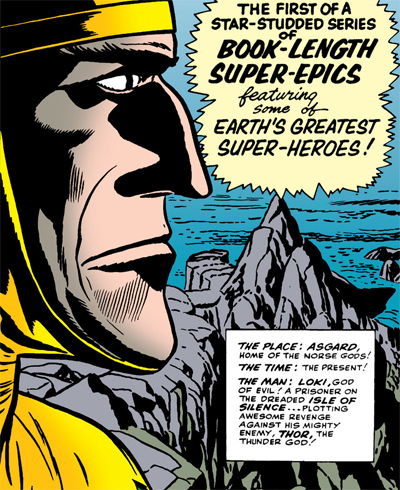 Similarly, I suspect Kirby was behind the story involving the lava men and the giant exploding stone buried beneath the Earth’s surface, as well as the storyline involving Captain America’s arch nemesis Baron Zemo hiding himself in South America. 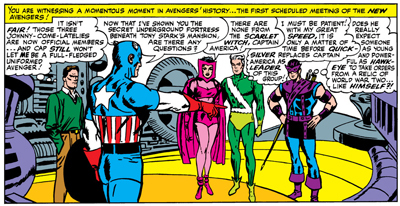 Still, this early run of The Avengers – almost spanning the first three years of the title – makes for fascinating reading. It’s interesting, for example, to observe just how deeply rooted the comic is in Marvel’s shared universe from the outset, with The Avengers skilfully drawing from concepts already established in other books. 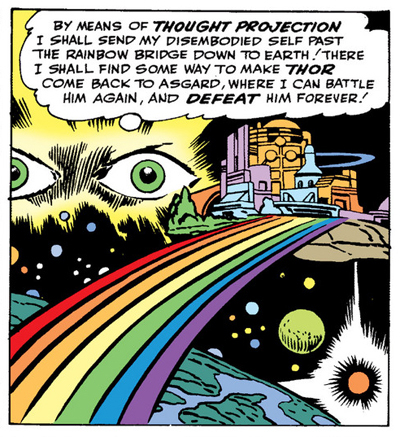 It opens with Loki contemplating his situation, while the Hulk bounds around the United States and calls on Rick Jones and his “Teen Brigade” (“a group of youthful radio ham enthusiasts”) to unite the heroes. Indeed, The Avengers is quite often and quite clearly driven by the events in the wider Marvel universe. 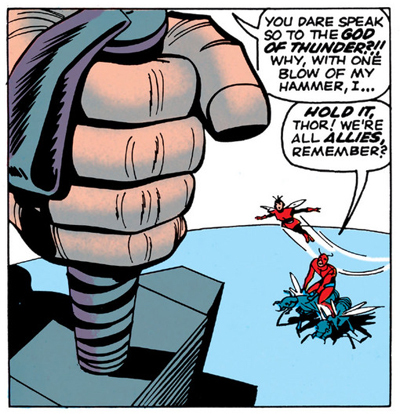 Thor and Iron Man, for example, are frequently absent to deal with their own problems – with helpful footnotes pointing readers in the direction of those exciting adventures. Villains frequently pop up from other runs – often with a minimum of motivation. At one point, the Mandarin schemes to put a pawn on the team, just in case Iron Man re-joins the group. 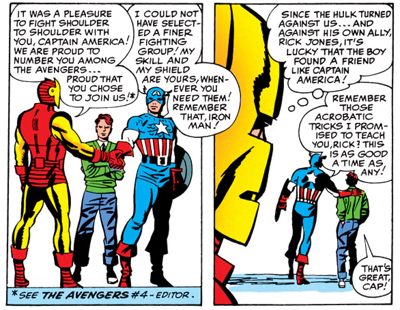 There’s a half-serious argument to be made that this first run of The Avengers really leans on a lot of the tropes of modern comic book storytelling. The third issue features all manner of cynical sales-boosting gimmick appearances, as Iron Man effectively tours the Marvel Universe asking anybody if they have seen the Hulk. Readers are teased to buy other books to get the full story of what is going on with certain characters. The issues even tease the sort of collector’s mentality that became so popular in the nineties. “We have a hunch you’ll want to save it as a collector’s item for a long, long time!” Lee teases on the opening splash page of Meet the Masters of Evil! Those complaining about modern comics relying too heavily on continuity or the shared universe, or gimmick-driven appearances or even appeals to the collector mentality, need only take a look at this run to determine that these are hardly new. Similarly, these early Avengers comics touch on some rather dark undertones. Although one suspects that Lee never intended the scenes to be quite as disturbing as they are, the relationship between Captain America and Rick Jones is downright creepy. Bringing Captain America into the modern age, Lee had made the shrewd decision to kill off the character’s teenage sidekick, Bucky – decades before Jim Starlin would kill off a Robin in A Death in the Family. I like the decision to kill of Bucky, if only because it underscores how incredibly illogical it is to have adult superheroes encouraging kids to run around in silly costumes fighting crime. 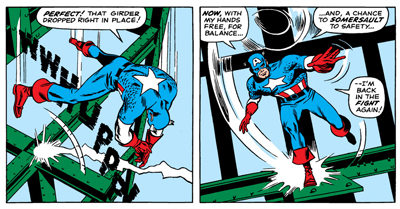 (Even in a world where people can fly and travel in time and lift buildings with their minds, reckless endangerment has always been a bridge too far for my suspension of disbelief.) Killing off the teenage sidekick held Captain America accountable for recruiting him to fight in the Second World War, and Bucky’s death is notable because it remained in continuity until Ed Brubaker’s recent Captain America run. Anyway, The Avengers portrays a wonderfully dysfunctional relationship between Captain America and another of the Marvel Universe’s superhero-hanger-on-ers. When he first encounters Rick, Captain America gasps, “You’ve come back!! Bucky, you’ve come back! !” It’s clearly more than just a momentary lapse brought on by the whole frozen-and-thawed thing, with Rick even remarking about getting him a “head shrink”, but the relationship quickly becomes even more unsettling. 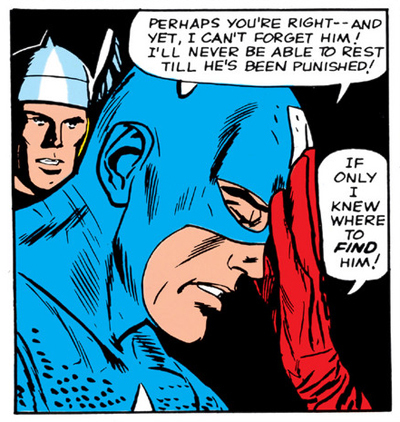 This being a Stan Lee comic, Captain America wallows in the angst generated by Bucky’s death. What with being a superhero and all, he seems to have great difficulty coming to terms with the fact that he led a teenager to his death. Things get a little more interesting when Rick Jones – and I’m not making this up – decides to surprise Captain America by dressing up in Bucky’s old uniform and cosplaying as Captain America’s dead sidekick. That is all sorts of messed up. It leads to the sort of creepy meltdown you might expect. “Look at how it fits me!” Rick boasts. “Anyone would think I’m you’re partner!” I love how desperate Rick Jones is to integrate himself into the superheroic over-class that The Avengers seems to wallow in. Captain America is suitably freaked out. “Take it off!! I never told you to wear it! !” Wertham would have a field day as Captain America slaps Rick Jones across the face, casting Jones’ domino mask off, ending a scene dripping with all manner of Freudian subtext. The decision to cast Captain America as the anchor of the team, and the central protagonist of The Avengers, is quite inspired, even if it seems that Lee isn’t quite sure how to write the guy. He has the “fish out of temporal water” angle down, but can’t figure out exactly what to do with it. After all, these comics were only published twenty years after the Second World War. The people on the street remember Captain America, and allusions are made to letters from people who had seen or encountered him before. Captain America isn’t too far adrift in time, despite his angst. 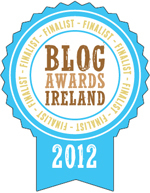 “I have a whole new world to rediscover,” he boasts, “a world which has advanced twenty years ahead of me! Hmmm, the girls are still as lovely as ever… but the fashions, the hairdos… how different they are!” If the most major difficulty Captain America faces is adapting to new styles, then it seems clear that the world has not changed too much. Of course, Stan Lee had a tendency to avoid engaging too heavily in potentially controversial social commentary, so it’s no surprise that Captain America never really engages with shifting cultural or political moors. 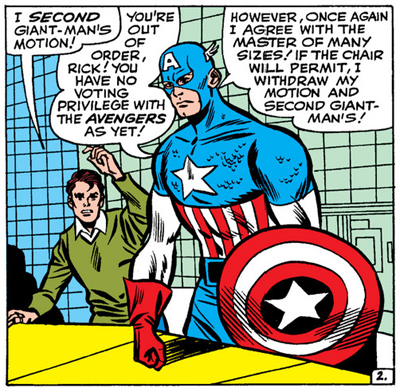 After all, Lee’s response to the unfortunate “Commie Smasher” chapter of Captain America’s history is simply to sweep it under the rug, hoping the audience at home doesn’t remember Steve Rogers’ brief role as Joe McCarthy’s muscle. 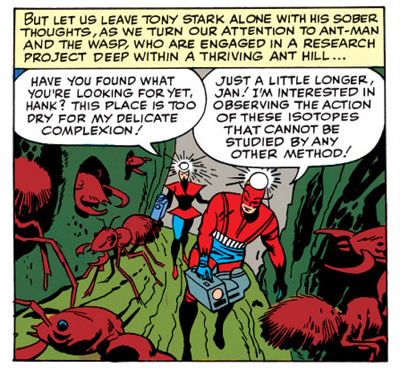 “You haven’t been heard from since the Second World War!” Ant-Man proclaims, and you can almost feel the characters pausing to stare out of the panel at the reader, as if nervous that their cunning ruse might be discovered. The Avengers is a remarkably apolitical work, with only the fight against the Commissar dealing explicitly with Cold War themes. So, writing Captain America, Stan Lee is shrewd to focus on his role leading the Avengers – suggesting that the character imbues the establishment with so much meaning because it’s really all he has. 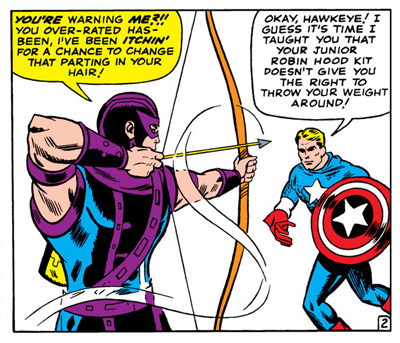 The Avengers also rather shrewdly changes things up, regularly. Unlike the Justice League of America, which has a fairly strong standard roster composed of most of DC’s big heroes, Lee very quickly establishes that the Avengers is a lot more fluid. It starts out as “Earth’s Mightiest Heroes”, with even the Hulk working on the team. However, by the end of its second year, the book has evolved to feature “Cap’s Kooky Quartet”, Captain America and a bunch of outcasts from other books. Quicksilver and the Scarlett Witch from X-Men. Hawkeye from Iron Man. It’s a vital part of what The Avengers is, and it’s great that Lee establishes it so early – the organisation is fluid and dynamic. 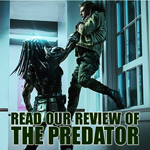 It can be the big hitters of the shared universe, or a bunch of outcasts. Either approach is entirely valid, as is the full range of possibilities positioned between those two extremes. While experiments like Justice League International or Justice League Detroit felt like surreal twists on the Justice League template, The Avengers is a book that can star a relic from the thirties and three former supervillains with no trouble whatsoever. However, one of the strange things about The Avengers is the way that it tends to feature characters who don’t really tend to thrive outside the team. While Captain America, Iron Man and Thor are always going to be solid sellers with their own titles, The Avengers tends to build up this back catalog of characters who arguably have a stronger history with the team than on their own. 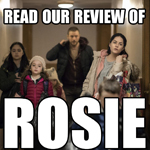 Barring a few acclaimed runs, including Matt Fraction’s wonderful on-going Hawkeye, Hawkeye has always had difficulty maintaining audience interest as a solo feature. Lee seems to acknowledge that – even at this early stage of the team’s history – various members of the team are not popular enough to thrive outside it. When things go wrong for the the Avengers, the book rhetorically wonders why the classic Avengers don’t simply come back. We’re told that Thor and Iron Man are busy in their own titles, but even the editorial team concedes that they have no idea what Ant-Man is up to at the moment. Another two perennial hangers-on, Lee admits that Ant-Man and Wasp don’t seem to have too much traction outside The Avengers. 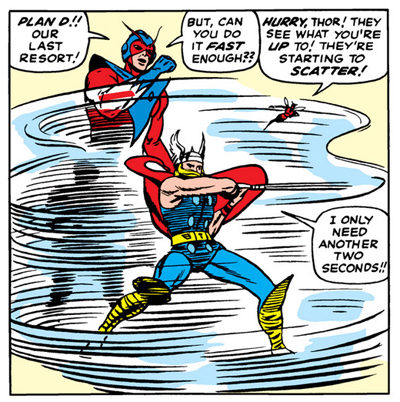 While Thor and Iron Man leave the team to have exciting solo adventures, Hank and Janet Pym decide to enjoy “temporary retirement.” That said, it’s quite clear that the marriage is less than healthy, even before Hank Pym earned his reputation as a spousal abuser. When forced to shrink to avoid an enemy attack, Janet remarks, “I don’t have much to say about it, partner, when you can control my size by just thinking me smaller!” It seems that Janet isn’t even allowed to control her own superpower under Hank’s watch. He’s shown as clingy and needy, at one point throwing a minor temper tantrum when she decides to leave. “Oh, stop being so dramatic, Henry Pym!” she protests. “And for heaven’s sake, remain one size, will you?” Janet isn’t portrayed in a much more flattering light, constantly adjusting her make-up and contributing relatively little to the team dynamic. The Avengers is far from my favourite of the Silver Age Marvel books, for a variety of reasons. Perhaps the most obvious is the way that it seems to wallow in itself, and remains curiously detached from the relatively grounded setting that made so many of these character relatable, but without embracing the high mythology of the best of the early Thor stories. Still, it’s a well-constructed comic, and one that really sets a blueprint for a lot of the modern Marvel Universe. I almost checked this out from my Library. So many great titles to read from the 60’s. I love your posts, too. You get into such depth and detail. Good job. Oh and I think I will go back and get this one before some other lucky person beats me to it. Hope you enjoy it! Not my favourite Silver Age material, but I can see why people like it. I only picked up the first Avengers Marvel Masterworks. It has the whole Stan Lee/Jack Kirby run so I can say “yeah I read the Stan Lee jack kirby stuff”. I personally love the Hulk in those issues. It all goes down hill after he leaves from my perspective. The Hulk adds a great “how will this possibly work?” dynamic to the whole thing, and probably the best example of The Avengers as a construct that really shouldn’t work at all – and building tension off the fact that it could fall apart at any given moment. I’m not a huge fan of The Avengers as a franchise itself, but I do love that tension. For all that the Marvel Universe is more internally consistent than the DC universe, having developed in harmony during the sixties rather than ad hoc over decades, there is just something brilliantly bizarre about a super soldier, a norse deity, a man in an iron suit, and a giant green rage monster teaming up to fight evil. You get that a lot less with JLA, where the only characters who feel like they don’t really fit in are Batman or Green Arrow. 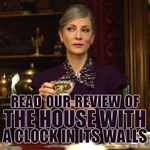 I don’t particularly care for the Avengers all that much either. I mean I love The Ultimates and the image of Iron Man, Thor, Captain America and all these second stringers are pretty cool. I never quite fell in love with it the same way I did Justice League. I guess it’s because Justice League is the focal point of the DC universe so it’s the only thing I’d read involving Aquaman or Wonder Woman. 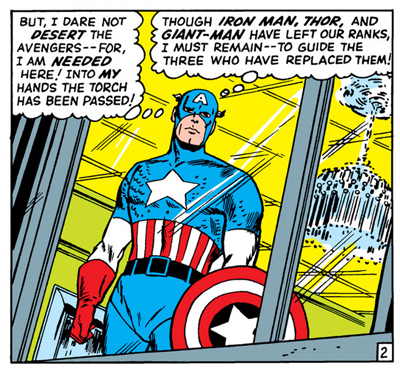 The Avengers is pretty unfairly being turned into that same kind of focal point, which it can’t be really. Darren, I recently reread that last paragraph, and you said that The Avengers was detached from the rather grounded universe at the time. My personal theory is it is intentionally written this way. A superhero universe gradually starts out realistically like our world, but grows more fantastic as it goes along. A point where several characters form a team shows that the world has been fundamentally changed by them. I.e. in some early Fantastic Four issues bystanders are surprised to the members claiming they were too far out to possibly exist. These issues, published around 2 years later, casually report Thor fighting Giant Man in the center of the city. It’s a fair point. But I think that The Avengers comes with a whole host of interesting class issues that are distinct from the stock Marvel template that I think the writers struggled with.